At Alpine SnowGuards, we’ve been designing, engineering, and manufacturing snow management solutions for nearly 25 years! Just over 10 years ago, the founder and President of Alpine SnowGuards, Brian Stearns, wrote the below editorial for RCI Magazine. A decade is a long time, and we’re going stronger than ever (and so are our snow guards that have been installed over the years). We’ve been doing this long enough to know what works. I once attended a seminar during which the speaker showed some pictures of a beautiful ancient stone roof that appeared to be two or three large slabs of slate or shale stacked to create a shingled effect. This picturesque setting had a European ambience and was spectacular in terms of roofing simplicity. 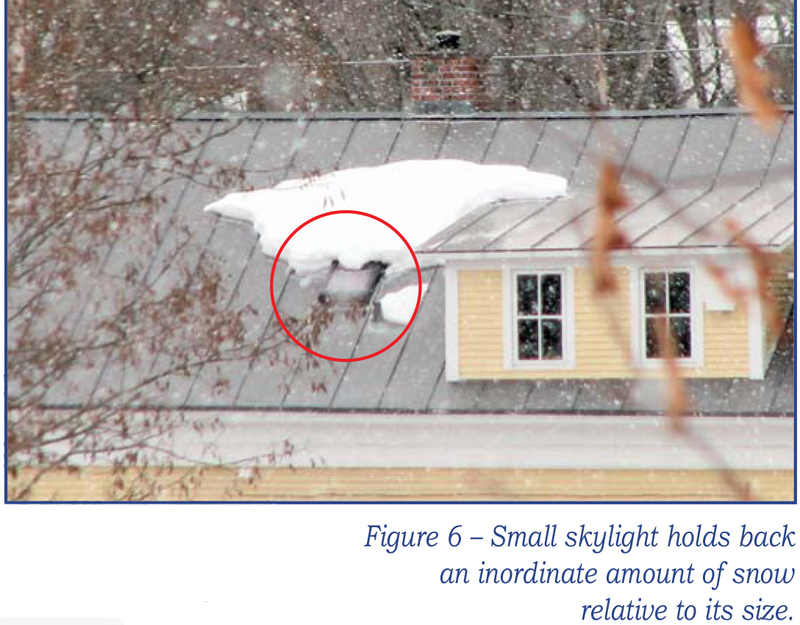 One of the pictures showed baseball-sized rocks randomly scattered around the roof surface. The orator explained that this was quite possibly the original snow management mechanism. such a thing when survival alone during this long-ago era was far more consuming than managing snow and ice on a crude shelter? I didn’t have the heart to tell this guy that these rocks were probably no more than the result of bored kids who were throwing stones up on the roof to be mischievous and kill time. My background is in slate roofing. Most of my work was accomplished in the North ­eastern U.S. Nearly all of the roofs that I have installed or repaired have had some sort of outdated snow management system. Some of these systems worked well, while others caused more damage to the roofs than they prevented. Finding a solution to this problem became my personal mission. Eventually, this mission led me out of the slate roofing business and into the snow management manufacturing business. What drives me from day to day is a constant search to improve upon what we now offer and to invent even newer and better ways to prevent avalanching snow and ice from any and all roof surfaces. To understand snow management systems, one must first have a grasp of what they are intended to do. These systems are designed to hold snow and ice in place on the roof until they melt and come off the roof as water, or in the case of pad-style snow guards, as very small pieces that come off slowly. Pad-style snow guards can be thought of as increasing friction, while pipe-style management systems act as a barrier as needed on the roof surface. In pipe-style applications, the barrier allows the melted running water to drain off under the snow mass while retaining the more solid mass above. small and random pieces–not all at once like an avalanche. design professionals and is established by the American Society of Civil Engineers (ASCE). 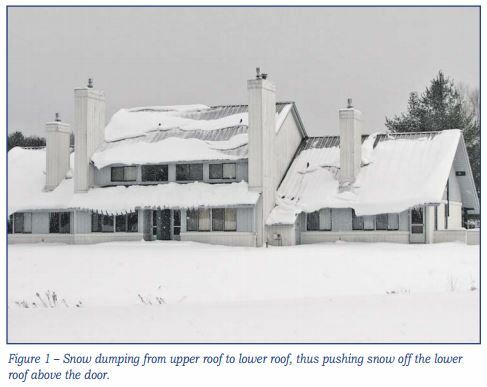 The next step in the design process is to determine whether or not the published ground snow load needs to be modified by various site-specific factors, including roof pitch, drifting conditions, building orientation, etc. These design considerations can be found in the ASCE-7 publication. The next step is choosing the best snow guard design for a specific project. This decision should first be based upon the function of the device itself. Pad-style guards, when used properly, are typically installed over the entire roof surface in quantities recommended by the manufacturer. Pad-style snow guards add friction but, as explained above, will allow the snow to slide off the roof in very small pieces as the mass melts and slumps. Pipe-style guards are used as a barricade or fence intended to keep all snow and ice on the roof, including that which has slumped. In many cases, more than one tier of pipe-style guards will be needed to manage the potential snow accumulation. In certain applications, both pad-style and pipe-style are used on the same building in combination to protect differing roof areas. Pad-style snow guards are generally not as strong as pipe-style systems but, when properly used, will accomplish the same thing. The difference is that pad-style snow guards need to be installed over the entire roof surface to be effective. 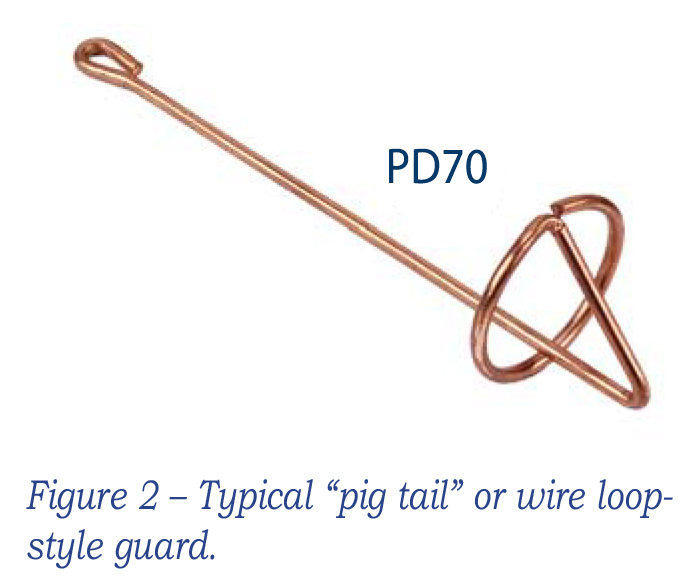 There is a very old pad-style device that is called a wire loop or pig tail (see Figure 2). When properly installed over an entire roof surface, this device creates a wire mesh effect. Also, when correctly installed in the proper geographic region, this is probably among the best snow management systems available. The problem is that these wire loop guards have an allowable load of 50 pounds each. This means that on a project where the snow load will be greater than 50 pounds, more than one snow guard per sq ft is required. Otherwise, the system is destined to fail. Likewise, if the project has a snow load of 25 pounds, one wire loop per two sq ft is required. Pipe-style devices are a little more involved (see Figure 3). Tests should be performed on each component part of each pipe-style device. The pipe-style system’s performance in a given roof substrate can then be evaluated and tweaked to determine the optimum bracket spacing to best manage the given load. To envision their use, think of waves washing over a coral reef. As the wave approaches the reef, the hydraulic pressure will sometimes make the water crest and wash over the top. The more water to hit the reef, the larger the resulting wave. 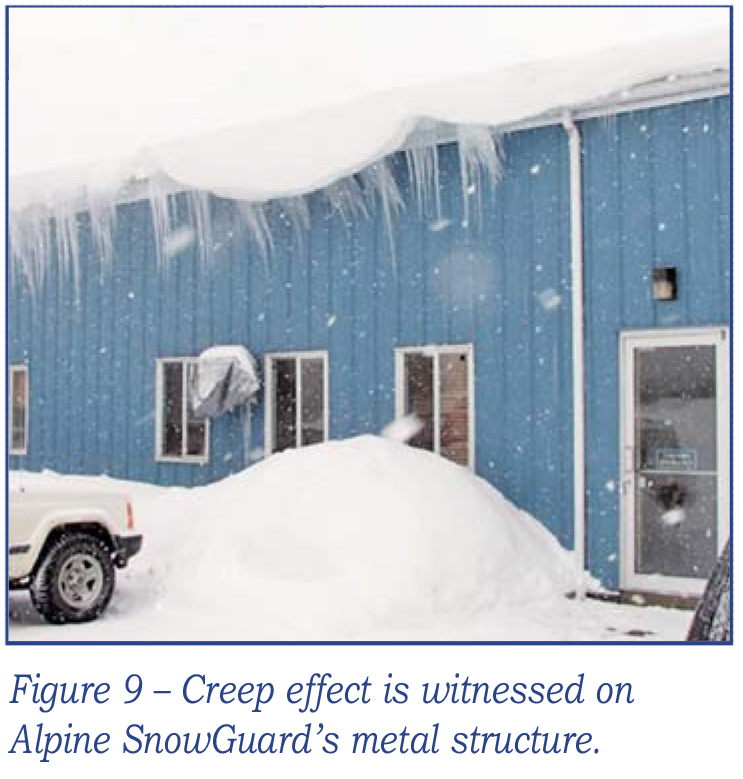 This same sort of phenomenon happens with pipe-style snow guards. They will retain a large snow mass. However, if the mass begins to slide, the pressure will often force the snow and ice behind the fence to crest and come over the top of the rails. This is most common when the roof does not have enough tiers of pipe-style snow guards installed. As with pad-style snow guards, the pipe-style systems have a given capacity. If the project’s snow loads exceed the capacity, either additional tiers of guards should be installed or the system should be supplemented with pad guards to add friction and prevent sliding over the barricade. Unfortunately, for either financial or aesthetic reasons, the wrong snow management device is often used, and the system fails. In fact, every snow management device of which this author is aware will work if it is used properly. 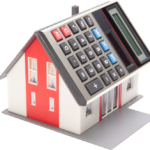 The key is having the correct roof-specific and product-specific data. 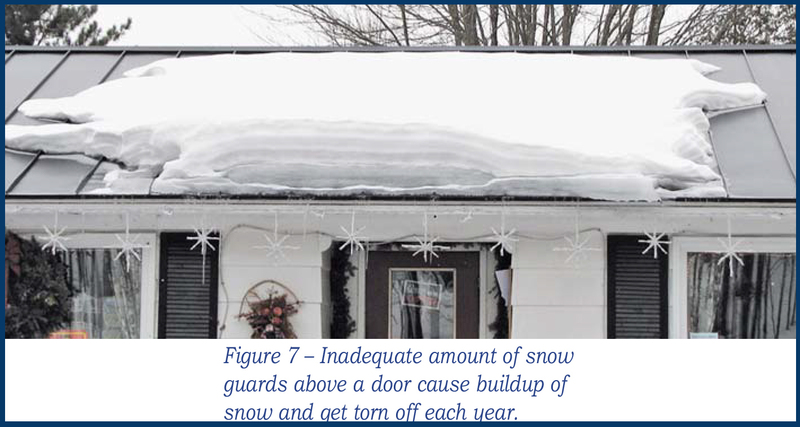 each and every snow guard it manufactures will yield on the roof surface–in other words, the actual tested failure point, not the perceived failure point. I say “perceived” failure since guessing seems to have been a common method of design in years past. The failure point is a critical piece of information because it is important that the system yields if the roof is overloaded and is not capable of supporting the weight of the snow mass being held back. How does one design a snow management system without knowing the strength of the device being considered? Manufacturers of snow management devices should test to ultimate failure. A safety factor of at least two should then be applied to the ultimate load value to establish an allowable load. Depending upon the roof conditions and importance factor (ASCE-7), the safety factor may need to be increased. In theory, snow management system design should stop here. Knowing the weight of the mass and the capability of the device should be sufficient. The mathematical formulas are rather straightforward. However, there is far more to design than a simple calculation. Sometimes snow is a liquid and sometimes snow is a solid. The mass to be managed will change as the temperature changes. Combine this issue with the fact that this ever-changing mass is poised on a sloped roof surface. For these reasons, the chosen style or type of device requires careful consideration. Talk to a technical salesperson at the company from which the device is being purchased. He or she should be able to explain all of the variables. But understand that even though the physical calculations applied may be mechanical, the science of snow and ice management is ever-changing. Over some of the winters in Vermont, we have had an opportunity to watch a different phenomenon unfold. I call this the “glacial effect.” In the Northeast, snow has tended to accumulate and stay for longer periods. It used to be that a January or February thaw would melt and clear the winter’s accumulation off the roof. These past two years have stayed cold, and the typical thaw periods did not occur. Instead, we saw a good deal of slow melt often brought on by thermal loss from within the structures. The result was a slow quarter- to half-inch “creep” of the entire snow and ice mass each day. 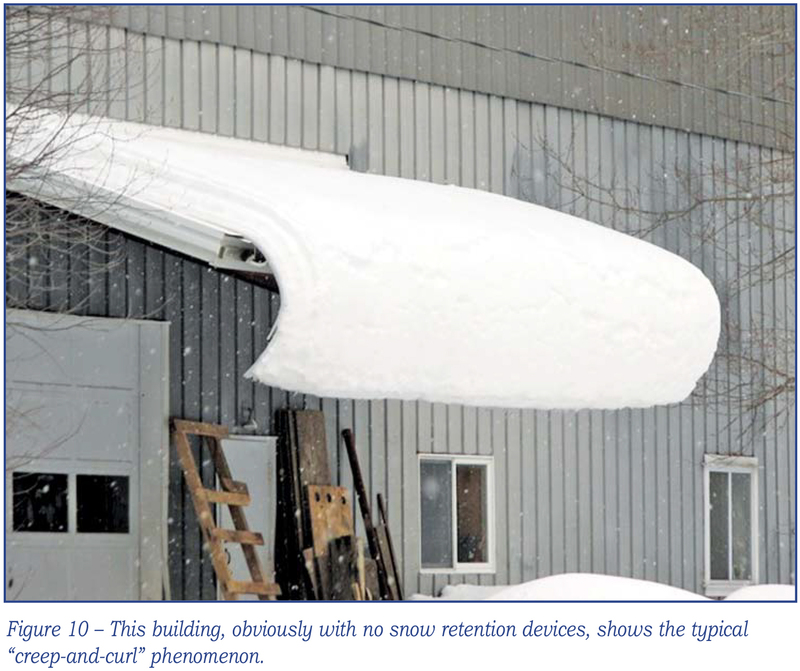 On our own commercial steel building, which has a pipe-style snow guard system with multiple tiers, the snow and ice mass crept out over the eaves sometimes as much as 18 inches before we were forced to knock it down (Figures 8 and 9). On some buildings, this “creep” effect was left alone and began to curl back toward the side of buildings. This was happening all over Vermont on buildings that had snow management systems installed. The point is that we can calculate to the best of our abilities the snow loads that will be on a roof based upon published reliable data. However, we cannot manage Mother Nature. A snow management system can do exactly what it is designed to do, but designers and building owners should recognize that the systems themselves may need to be managed in extreme and unusual conditions. This includes removing snow and ice behind snow management systems if snow loads in the area appear to have exceeded the building design loads. Another interesting development in the world of snow management systems is the need for snow guards arising due to the installation of solar arrays. These arrays are being installed on top of many composition shingle roofs that have rarely needed snow management systems to date. The granules on the surface of composition shingles have always functioned as friction. But now we are installing glass arrays above these composition shingle roofs that act as an almost frictionless surface no different than a metal or slate roof. This, combined with the thermal differential between the existing roof and the panels, will certainly create a need for some creative engineering. This is an example of how ever-changing needs and technology continually impact and change how we deal with snow on a roof. When designing snow management systems, gather all of the building-specific information available. Then gather all of the snow management information available. Talk with local roofing contractors about their experience with given snow management products, discuss the situation with a variety of snow management product manufacturers, and design from an educated perspective that minimizes guesswork. Questions? Let us know – that’s what we’re here for! 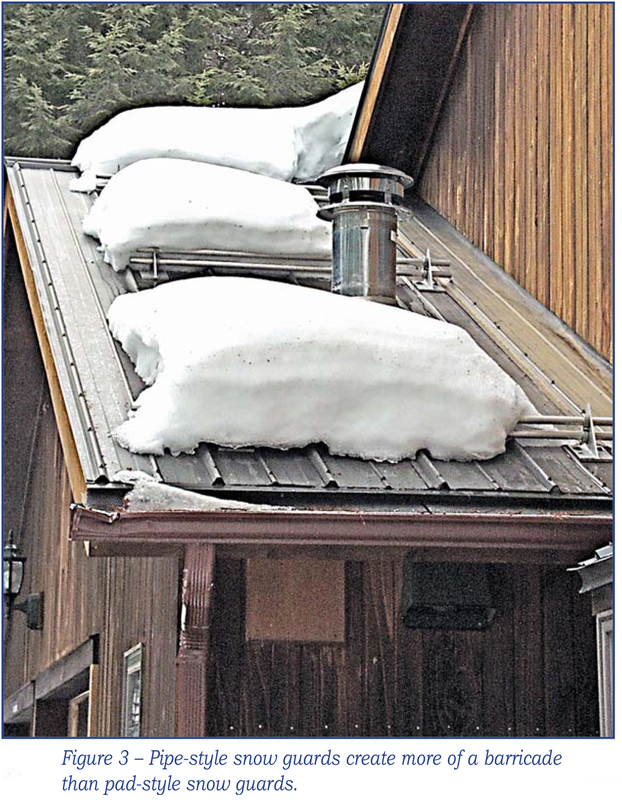 ← Shingle Roofs Need Snow Guards, Too!